It begins with Thomas that coming to meet us at the port of Andros Island. A truly outstanding tribute. its continued professional service beyond our expectations. The apartment complex is beautiful, comfortable, and well equipped for preparing self-catering meals. The distance from the beach is very short and yet the house is far enough to create perfect privacy. And the pool certainly adds a sense of luxury. We are likely to come again next year. The owner's hospitality and friendliness, the room's cleanliness and amenities, the balconies' view. Beautiful, beautiful place. Thomas thought about every detail to make the place cozy. He keeps the place very clean. We miss already to sit on the veranda to have the breakfast or a beer in the evening. It is so quiet with a view of the sea. The pool is also great. Our children enjoyed it every day. The wifi was perfect. Beautifull house, quite position, wonderfull sea view. The owner is every time available and always give good advice about the island. I have travelled a lot and i never found such disponibility as in Andros Luxury House. Thanks Thomas!!! Pane fresco dietro la porta tutte le mattine! Colazione oltre le aspettative. Ambiente circostante silenzioso. Pulizia della casa. Il gestore, Thomas, un personaggio indimenticabile! Difficile trovare persone così, sempre disponibile, mai invadente. Il luogo è tranquillo, vicino a tutto: mare, taverne, servizi. Πολύ ωραίο, καθαρό, φωτεινό, άνετο διαμέρισμα, με σωστούς χώρους για μια οικογένεια μέχρι 4 ατόμων. Σχετικά κοντά σε παραλία, αλλά καλό είναι να έχει κανείς αυτοκίνητο, για να μπορεί να μετακινείται εύκολα προς το Μπατσί και τις άλλες παραλίες της περιοχής. Υπέροχη θέα και ησυχία, μέσα στο πράσινο. Και ευχάριστη έκπληξη: το πάνινο σακουλάκι με το ψωμί κάθε πρωί στην πόρτα για το πρωινό! Ο ιδιοκτήτης πολύ φιλικός και εξυπηρετικός, πάντα διαθέσιμος. η φιλοξενία ήταν εξαιρετική. πολλα συγχαρητήρια στον κύριο θωμά, ιδιοκτήτη του καταλύματος, ο οποίος με μεράκι και πολλή αγάπη εξασφαλίζει στους επισκέπτες μια άνετη και ευχάριστη διαμονή. σύγχρονες εγκαταστάσεις, άνετοι χώροι, φοβερή τοποθεσια. πραγματικά αισθάνεται κανεις όπως το σπιτι του!!!! σιγουρα θα ξαναπαμε!!!!!!!!!!!! Lock in a great price for Andros Luxury House – rated 9.7 by recent guests! 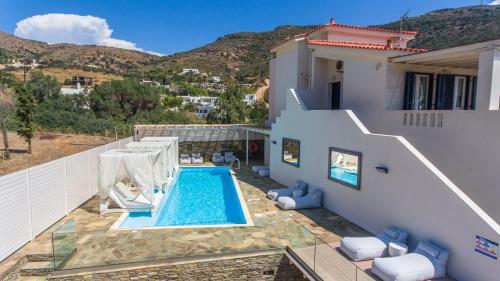 Located in Kypri, Andros Luxury House has a 40-m2 outdoor pool with variable depth and great views over the Aegean Sea. It offers self-catering accommodations with Aegean Sea views from their furnished terrace. Guests will find a bus stop, restaurants and cafés at a distance of 650 feet. Simply yet tastefully decorated, all apartments come with 2 bedrooms and a spacious living room with a flat-screen TV and DVD player. A fridge, oven with stovetop and coffee machine stock the kitchen. Nespresso coffee machines, slippers, hypo-allergic mattresses, memory foam pillows and safety deposit boxes are also offered. Guests are provided with beach bag and beach/pool towels. With extra cost the guests can prepare their breakfast with the fresh fruits, juices and a variety of homemade jams provided by this property. Andros Luxury House is located on the western side of Andros Island, just 2.2 mi from the port of Gavrio and 2.8 mi from the cosmopolitan village of Batsi. Free private parking is available in the premises. This property is also rated for the best value in Kipri! Guests are getting more for their money when compared to other properties in this city. 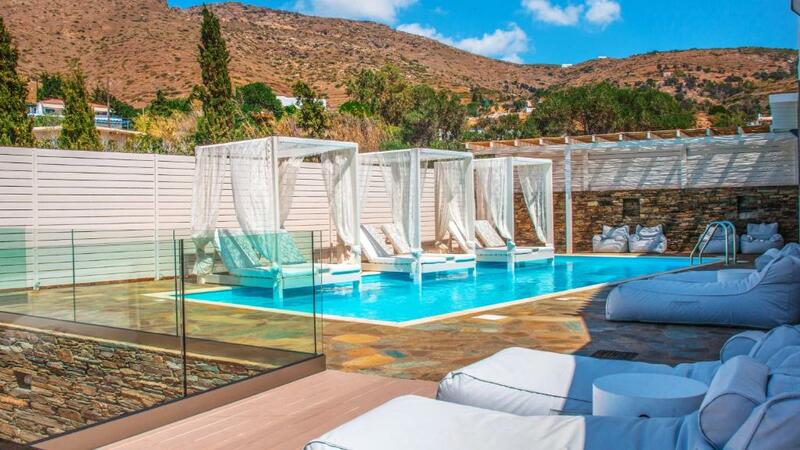 When would you like to stay at Andros Luxury House? Please note that one of the bedrooms is located in an attic and it is accessible by stairs. This villa features a sofa, toaster and stovetop. Follow the path through for your holiday inside from the Andros Luxury House and take you to a journey of absolute relaxation and bliss. Indulge yourself to the luxuries of the House and enjoy your morning coffee by the pool that overlooks the endless Aegean Sea, where the horizon blends with the calm pool water. Ample outdoor furniture, along the lavish decking area, guarantees absolute comfort in any state of mind. Walk through the house and you’ll be enchanted by the incredible decoration to detail, the bright rooms, the living rooms and bigs terraces gazing upon the Aegean blue with sublime views. Every single corner of this wonderful house has been thoughtfully designed and furnished with love and respect to bring out the very best of its. Photos will only give you a small part of the whole picture in staying at this house, as most of the experience can’t be framed in a snapshot. 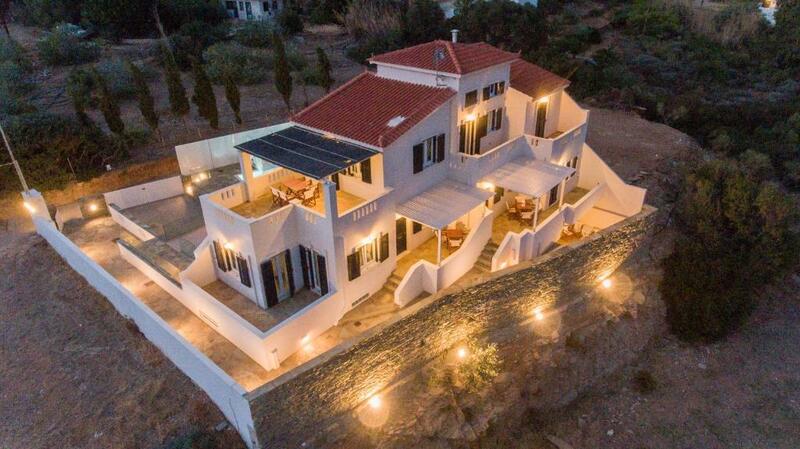 The house offers complete privacy, it is built at an amphitheater-like style with breathtaking view to the Aegean sea having a protects from the winds. 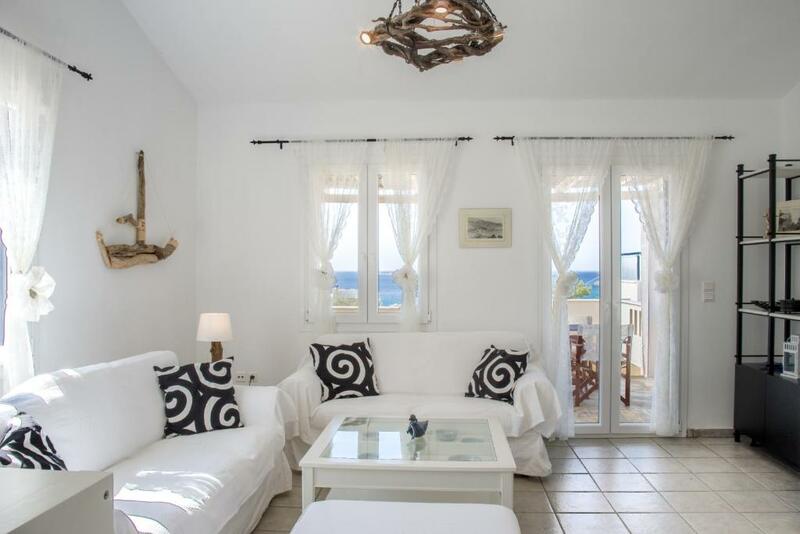 It consists of three independent apartments that connect from the outside, all with their own separate entrance, the maximum number of guests that can be accommodated to thirteen (13). There is a superb 40 square meter swimming pool with variable depth of 30cm-150cm without chlorine with great views from within the pool, towards the Aegean sea. There is also an outdoor shower, with pergolas and a private parking that comprises of an open area. There will be someone who will be waiting you when to arrive at the port to welcome you and to show you the road to the property via "follow me". The Andros Luxury Houseis truly a place to experience the natural beauty of Andros while satisfying at the same time the need for privacy of unrivalled comfort and aesthetics, as it is fully equipped according to top-notch specifications. This luxury house will appeal to families looking for a peaceful summer break. House Rules Andros Luxury House takes special requests – add in the next step! Please note that in case your reservation is room only, breakfast can be added at extra cost when you contact the property in advance and not on arrival. These breakfast amenities are available in the rooms, since it is self-service. Please inform Andros Luxury House of your expected arrival time in advance. You can use the Special Requests box when booking, or contact the property directly using the contact details in your confirmation. The House property was more than beautiful. Better than in the pictures, impeccably clean, spacious, comfy with a nice plenty view to the sea. Situated on a quiet slightly uphill at a 10 min. walking distance from the main road, so you can enjoy a good sleep. (At night’s silence, if a bit windy, you can even listen to the waves lulling soft sound). The location is at a convenient distance in between the Gavrion port, Batsi village and the beautiful sandy beaches. The apartment is tastefully decorated and very well equipped with a thought at every detail! (Flat screen TV, audio system, Excellent WI-Fi, coffee makers for espresso and French type, very nice sets of dishes, cups and glasses, a variety of pots if cooking something,) Very comfortable bedding with memory mattresses and pillows, lots of storage, excellent bath-room with toiletries and soft towels for in-house and out-doors for the cute swimming pool rest/ sunbathing area. If you book your stay with breakfast, you will enjoy preparing it at your own, with different kind of cereals, jam, honey, fresh oranges and fruits and in the fridge you will find butter, ham, eggs, cheese, yogurt, milk. Every morning, you will also find a fresh loaf of bread, inside a beautiful cloth pouch, hanging outside of your front door handle! This is an additional touch of concern, a real “good morning wish” of the excellent Host Mr. Thomas. He made sure everything was perfect and was always available, discrete and more than polite. He surely knows that hosting people is not just a routine job, but “the art” to fulfill the guests’ probable needs and make them have a happy and unforgettable holiday’s stay. Thank you Thomas, Congrats! Looking forward to return for sure, soon.